Before we get to today’s choice though, I think we need to have a serious discussion about the Official Perfect Picture Book Snack. Something Chocolate has already been taken for Would You Read It Wednesdays, so put on your thinking caps boys and girls, and let’s come up with something scrumptious! 🙂 Because I’m a mite peckish! The comment section is open for suggestion…. But back to PPBF…. I love books that turn out to be something you didn’t expect. I love getting to the end and thinking to myself, “Wow, that author was clever!” I love books that I like better every time I read them. And that is just the kind of book I’m sharing today! Brief Synopsis: One by one, the students stand up and brag about what their parents do – a UFO hunter, a jeweler, a NASCAR driver. When it’s the narrator’s turn, she says her dad changes light bulbs, which seems pretty tame compared to what everyone else does… until she reveals which lightbulbs! 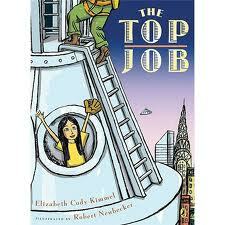 Why I Like This Book: What kid wouldn’t love to have a parent with a really cool and unusual job? This book is set up very cleverly. The first few kids to introduce their parents careers all brag – their parents are UFO hunters, jewelers, and NASCAR drivers. Pretty hard to top! When it’s the narrator’s turn, she sets them up, saying her dad changes light bulbs. Of course they make fun… until they find out where the light bulbs are. The pacing is great, letting the reader discover a page at a time that all isn’t exactly as it seems. I also love that the story is based on fact – someone really does have to change those light bulbs and it’s a pretty tricky job! This book offers a great deal of information about a little-known job as well as a great opportunity to talk about all the different careers that are open to kids when they grow up. It’s interesting, educational, clever, and fun! In other news, I wanted to share the Reach Out And Read report with you but I don’t have the pictures yet, so I’m going to save that for next week. I’m looking forward to seeing what Perfect Picture Books everyone else chooses today – it’s always so much fun! And then we all have tons of great new choices for the weekend – to read to our kids, plan upcoming lessons, or to learn from as writers! What could be more fun than that? Please post your Perfect Picture Book link below and have a great weekend! The resources are a dead giveaway about where the light bulbs are 🙂 And your snack sounds SO GOOD!!! !